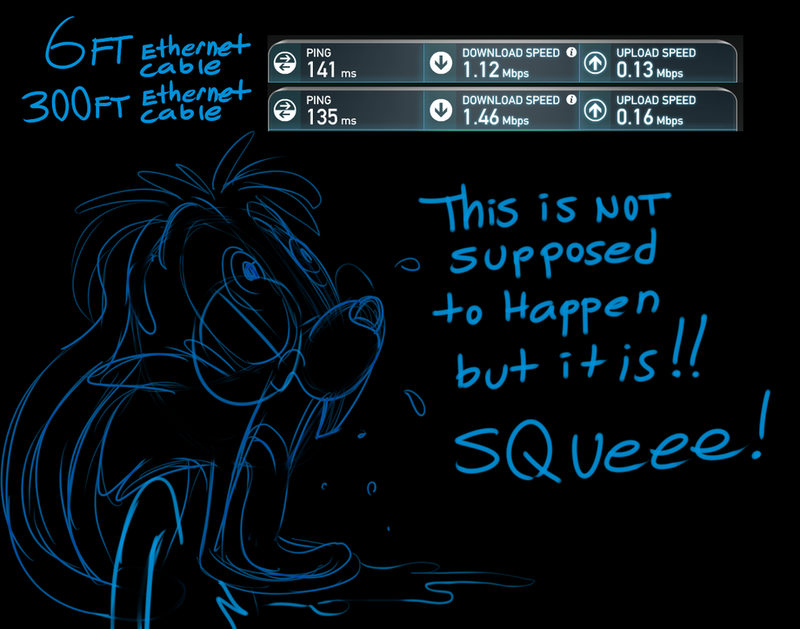 I don't know how a 300 foot ethernet cable can beat a regualr 6 foot ethernet cable in a speed test, but there it is lol! I have the thing coiled up on my desk/table right now, hooked up to my modem and computer. Ran the same speedtest on the same site....my mind is now boggled. Yeah, that's what I said. I totally expected it to do WORSE not better! LOL! the grades of wiring inside could be different, there could be a bend in the 6 foot cable that is causing trouble or other problems. Not all cables are made the same. Connections, connectors, shielding, etc, can all affect performance. So true. I guess I really got my money's worth when I shelled out $60 for this cable. It sure whips the pants off the walmart $7 special. The brand of the long one is UltraSpec btw. I dunno about the 6 foot one, it doesn't say and I've had it forever. Yow, for $60, I wouldn't even notice the speed difference. Well I actually expected a drop in performance. Obviously the longer cable is of much higher quality. There are so many types, like cat 5, cat 5e, cat 6, cat 6e and I've recently seen cat 7. Supposedly, the higher numbers translate to higher performance, but I can't find much on the net about cat 7 specs. Everything I have is cat 6, and I've never had any cable-related slowdowns. I normally get between 30ms and 45ms for the ping speed. You mentioned the solution right in your post: The coil. Any excess RF interference that the shorter cable is picking up, is being blocked by the ridiculously long coil of shielded twisted pair ethernet cable. As it has been mentioned it has to do with the quality of the cable. Naturally a Cat 6 cable will outperform a Cat 5e cable. Its all about the materials in the cable and the category and overall quality. Also, theres a good chance the 300 fter you got is STP, or Shielded Twisted Pair. Most smaller cables are UTP, or Unshielded Twisted Pair. A STP will outperform a UTP any day, and usually for longer lengths, such as 300 ft, STP is a standard. Usually anyways. In any case, congrats on the better speeds, and I say whatever works best, use it. I wasn't aware internet speeds could still be so slow. They don;t even sell anything less than a 3 mpbs where i am at. It's called DSL, it's not cable. I've had DSL in two different towns in two different states, both of them offered a max of about 150Kilobytes per second. Not everybody can have cable or fiber optics in their neighborhood. even for dsl thats kinda down there. But I didn't mean anything bad by it. I really like you and your work. sorry if I upset you.